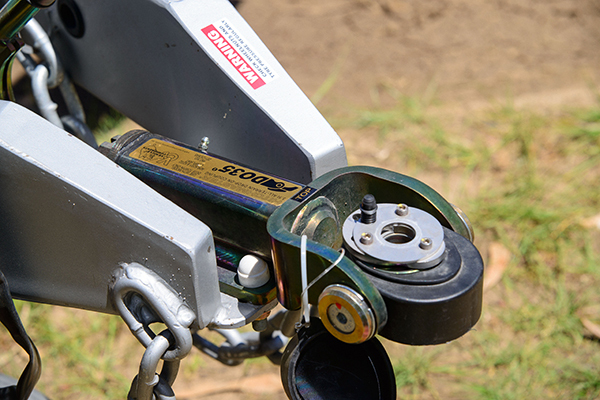 Based in Somerton, Vic, Melbourne City Caravans opened its doors just over 12 months ago. It was established by husband and wife team Fabio and Cettina Bazzacco, and Cettina’s brother Joe Capodicasa. The past year has been something of a whirlwind romance for the company within the RV industry, and it looks like developing into a happy and lasting relationship. The genesis of Melbourne City Caravans was the culmination of the trio wanting, for many years, to create and grow their own business. Fabio has more than 25 years’ experience supplying to the building and construction industry, including importing raw materials for the caravan industry, while Joe was a self-employed business owner for five years and has more than 20 years’ experience in sales and managerial roles in the motor trade. Cettina was a self-employed business owner for 18 years with 20 years in office/finance management roles, including a senior finance role in the caravan industry for nearly 10 years. All three have a love of travelling and the outdoors, and an equal desire to offer customers a personalised service and high quality vans at very competitive prices. They are the exclusive dealers for Grand Salute. And, following CW’s review of this Grand Salute Edinburgh, I reckon the Grand Salute range has certainly met that brief. Purpose-built for the keen adventurer, the 6.24m (20ft 6in) Grand Salute is an ideal van for semi-offroad journeys. And, after seeing first-hand its quality craftsmanship, I see no reason to argue. 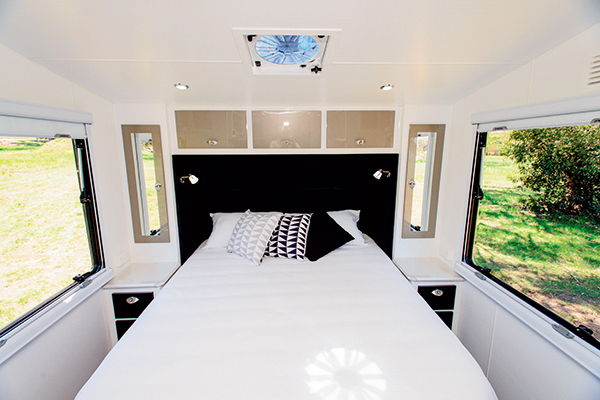 ali-comp cladding on the front and back and silver ali-comp sides provide a striking aesthetic. But it’s what lies beneath that will take you well off the bitumen and into a more exciting discovery of our harsh brown land. 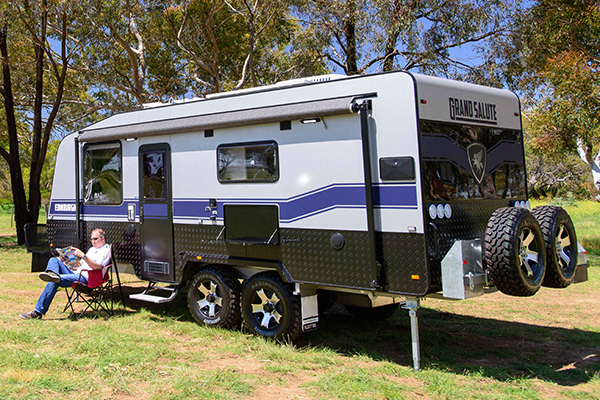 The tandem-axle Edinburgh rides on a sturdy 6in Austrail RV DuraGal chassis and an equally durable Cruisemaster XT 3.5t independent suspension. And its heavy duty offroad Westlake 16in mud-terrain tyres simply magnify the van’s semi-offroad credentials. 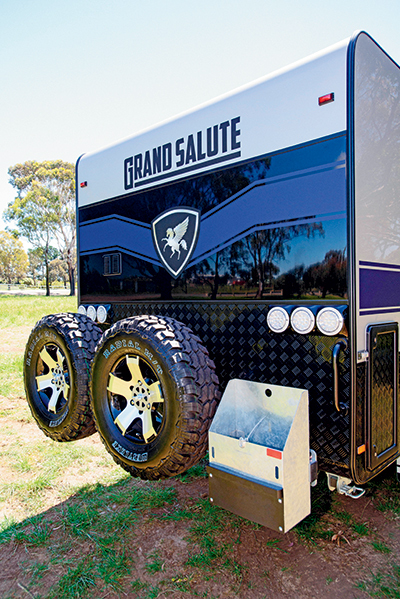 The Grand Salute is also well-equipped for extended off-the-grid stays. 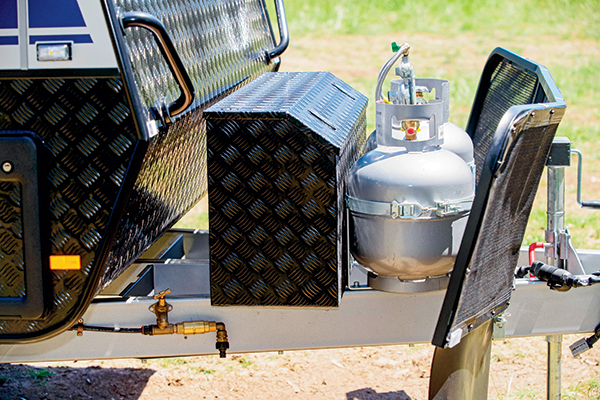 A 360mm extended A-frame neatly holds a large toolbox and twin 9kg gas cylinders (all protected by a mesh stoneguard), while the battery (2x100Ah), solar (2x150W) and water (2x95L fresh; 1x95L grey) capacities means you won’t be scrambling for mains power in any hurry. I liked the Edinburgh’s external storage offerings, including a good-sized front tunnel boot and a rear offside hatch ideal for a generator. 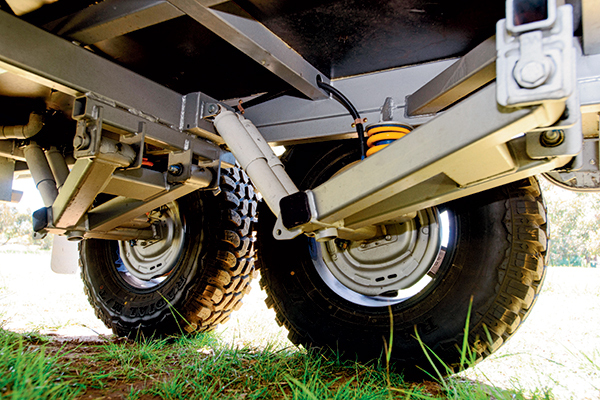 Its two spare tyres and two 20L jerry can holders will help you out of unexpected dilemmas. 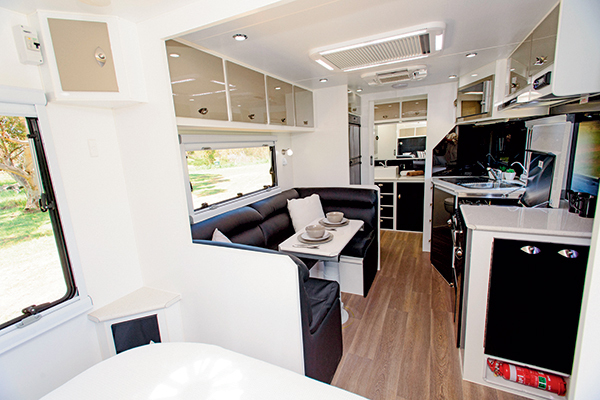 Built for outdoor lifestyle, the Grand Salute has a roll-out charcoal awning and a drop-down picnic table but an external kitchen and TV hatch would complete the picture. Entry is via the van’s midriff and immediately you’re exposed to luxurious living quarters. I’ve always liked angled kitchens and club lounges and these ones were no exception; not only did they give the van a very spacious feel but they also showed good attention to detail. Perhaps it was an optical illusion but their central location appears to really work in terms of roominess. The angled design of the kitchen allows for plenty of bench space, and the laminated rolled-top post-formed benchtop sparkles. 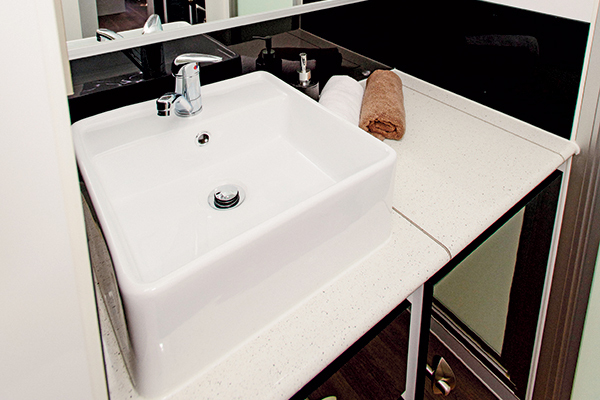 The glossy acrylic cabinetry is eye-catching. And the cupboard doors are piano-hinged with shell-lock catches, while all the drawers are on rollers. But it’s the stunning full-height acrylic splashback that takes the cake visually. Mind you, the galley is also well-equipped courtesy of a Swift four-burner cooktop, oven and grill, 12V LED rangehood with twin fans, single bowl stainless sink, a Camec microwave above the sink, 184L Thetford three-way fridge/freezer, and a slide-out half pantry. Meanwhile, the leather-look club lounge illustrates practicality and relaxation. 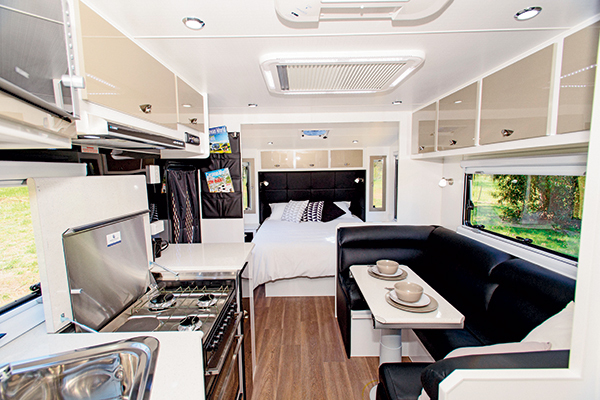 It has a drop-down table that converts into a bed, giving the van three-berth status. So you can take one of the kids or grandkids along for the ride! The panoramic double-glazed window invited plenty of natural light – a common theme throughout. A couple of large roof hatches also assist in that regard. Sensibly, the van’s electrical suite is confined to an overhead locker. The front bedroom is a plush affair featuring a caravan queen-sized island bed with lift-up storage and a pillow-top mattress. Once again, storage space is prominent given the ability to pack away plenty of travelling apparel in three overhead lockers. And I admired the mirrored wardrobe doors, which add a dash of class and extra convenience. 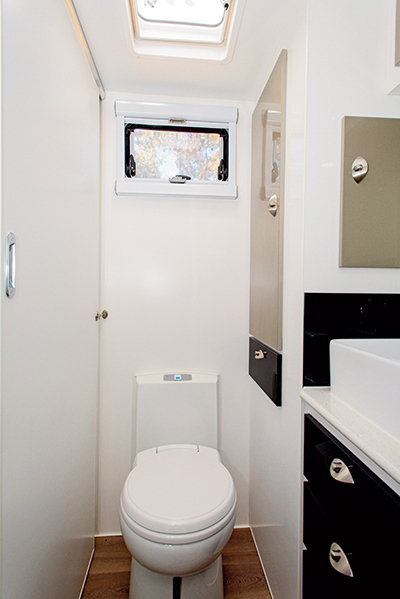 The rear full ensuite is swish and modern – with all the requisite mod cons to boot. It comprises a full-height one-piece moulded fibreglass shower, Thetford ceramic swivel toilet, and a chic vanity with a ceramic washbasin. But what grabbed my attention is the sizeable linen cupboard, which certainly takes the stress out of finding room for bed sheets, towels, bath mats and other bathroom accessories. 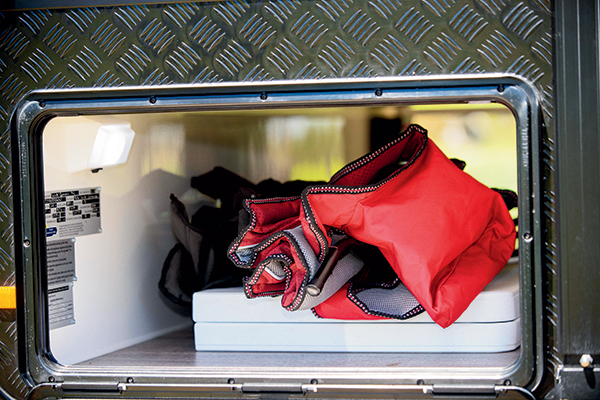 I reckon a washing machine is vital when on the road for extended periods – enter a 2.5kg Camec top-loader concealed under the vanity benchtop. The Edinburgh also has excellent weight distribution, with Fabio advising that with a little tinkering the team has been able to reduce the Grand Salute’s ball weight of 244kg on an earlier model down to 200kg. It also has a massive payload of 880kg. The Grand Salute Edinburgh comes with a four-year nationwide warranty. The Grand Salute Edinburgh is a robust van that could handle any semi-offroad environment, and offers high-end luxury at an affordable price. It has a raft of standard inclusions… what you see is what you get! And, at $67,990 plus on-road costs, it has most of the bells and whistles you’ll need to set off on an adventure of your own.